As expected, the number of offices in battleground states outpaces the number in other states. Florida and Ohio account for 235 of Obama’s 786 offices (30%), similarly for Romney (31%). Obama has broader coverage (all 50 states) and outpaces Romney everywhere except Utah and Missouri. Obama also has more offices in battleground states (e.g. 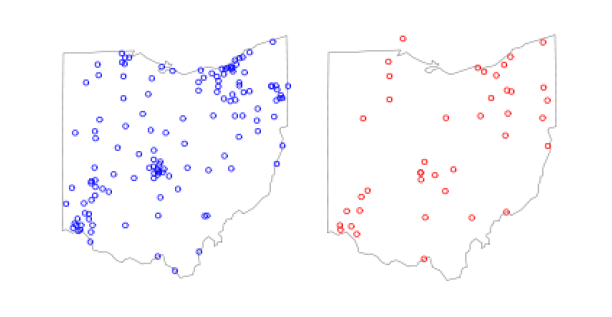 Ohio has 131 Obama offices vs. 40 for Romney). The campaigns clearly differ in the number of field offices and I look forward to potential explanations. Less likely, the Obama website is a more complete record of office locations than the Romney site for some reason. More likely, the Romney folks made a strategic decision to invest less here either because they do not see the same value in having offices given their supporters and resources, or they believe they have other tools to achieve the same ends such as managing volunteers remotely and electronically. The Obama campaign actually agrees: Real estate isn’t the point. “Our focus is on having a very decentralized, organized operation as close to the precinct level as possible,” Bird said. In addition to all those offices, the campaign operates out of dozens of “staging locations,” many of them the living rooms of neighborhood leaders who have been working with their volunteer teams for a year or more, fanning out into the communities they know firsthand. Nevertheless, here is some research demonstrating an association between field offices and election outcomes. Lynn Vavreck and I will be using these and other data from the “ground game” in The Gamble. More to come. Which House races have the most at stake? Great . . . but, for your book, please don’t graph the states in alpha order! Well, the point is that more field offices means more voter contact. Are field offices really necessary to run an efficient campaign? Are field offices necessary for voter contact? After all we aren’t in 1890 anymore. Voters don’t need to walk into a field office to learn about the Party or the candidate. And organizers don’t need to convene physically before they canvass a block (have you seen the new iphone app?) What matters is NOT the number of field offices but how well these field offices are organized. Good coordinators and planners are more important than physical offices. Also think about these— how many field offices does AARP have? How about NRA? These organizations can run a heck of a campaign without planting field offices in every neighborhood. As for the finding (the number of field offices correlates with vote share), the relationship goes backward. If you think you’re losing the battle, there’s little incentive to pop up new stores. Are field offices really necessary to run an efficient campaign? Are field offices necessary for voter contact? Yes, and yes. Next question? Field offices coordinate the voter contact operations, especially with an intensely local operation as the Obama campaign’s. That’s why it matters as much where campaigns put field offices within a state as it does which states receive them. 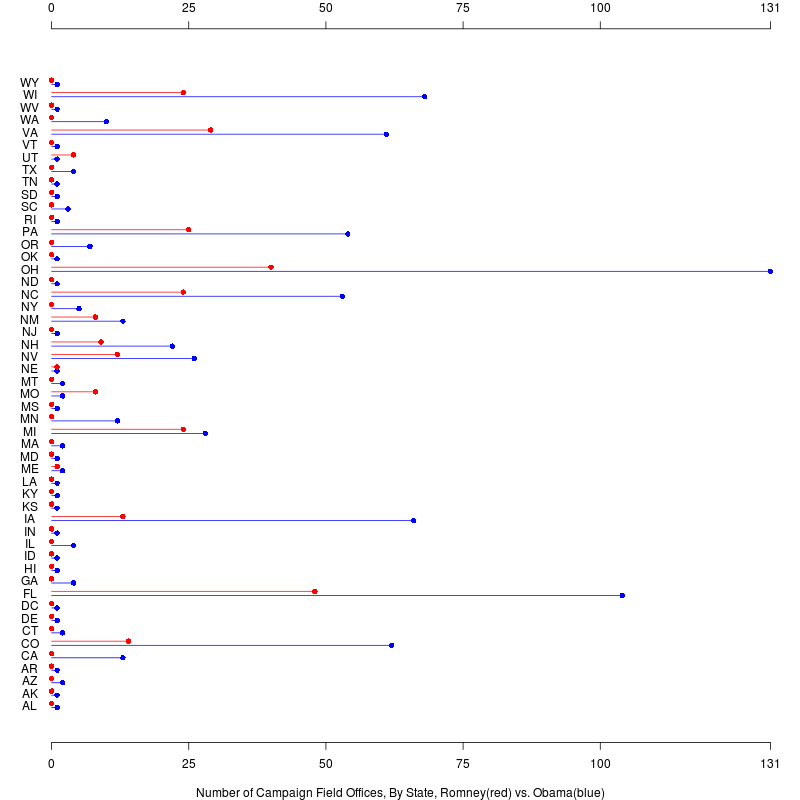 My co-authors and I have written a paper that examines this placement strategy and its effects on county-level vote share using a nationwide sample of 2008 and 2004 field offices (can’t wait to get this year’s into the dataset), as well as individual-level measures of field office effects and spillover effects into House races. We presented at MPSA last year, and the paper is currently under review. If you are interested in reading that over for your chapter in The Gamble, feel free to e-mail me and I’ll send it along: jdarr (at) sas dot upenn dot edu. The paper includes nationwide maps of 2004 and 2008 Democratic field office placement, if anyone enjoyed the maps in this post and wanted some perspective. Just curious: does the data include local party offices? Some anecdotal evidence suggests that national parties differ in how they delegate. The Republicans seem to delegate more to state and local parties. So maybe the gap between Obama and Romney, in part, bears that out? The Utah field offices are basically satellite offices for Colorado and Nevada. No efforts are being made to mobilize within Utah but lots of people are being recruited and sent to neighboring states. Those that can’t travel are put on cell phone to call battleground states.